Silicon Valley is hurting. Intel, Microsoft, and other high technology giants are announcing tens of thousands of layoffs. Unemployment in Silicon valley hit a new high of 7.8% in January, 2009. Many of the high-tech companies rely on foreign-born technologists, particular those from India, China, Israel, Pakistan, Philippines, and other nations. Thousands of these workers are facing the ax, with the H1-B workers particularly fearing the worst. When times were good, the high-tech companies lobbied for and got over 100,000 yearly H1-B visas approved by U.S. Congress. The largest number of workers who were hired with the H1-B visas were of Indian origin. Some of them suffered abuse at the hands of their employers and the intermediaries who helped place them. "H1-B slavery" was the term used to describe their situation. Things have changed dramatically in the last few months. And they are going to get much worse in 2009. In a letter addressed to Microsoft, U.S. Senator Charles Grassley has asked the company to layoff foreign workers before laying off skilled American workers. Today's San Jose Mercury News has highlighted the plight of two Indian engineers on H1-B visas who recently lost their jobs. For them, it's a race against time. They need to quickly find other jobs at a time when companies everywhere are cutting back. Both Jay and Prasad (fictitious names) have advanced degrees earned from elite American universities. And both are facing the inflexible rules of their H-1B work visas. Technically, as soon as they lost their jobs, they were required to leave the country. In reality, they can probably stick around for a week or two, but not much longer. There are no statistics available yet on how many of the job cuts have already hit or soon expected to hit H1-B workers. But San Jose Mercury is reporting that this "stark dilemma is being repeated with increasing frequency across Silicon Valley, according to immigration specialists, as companies downsize to weather a punishing downturn. It's a small number compared with the layoffs of H-1B visa holders during the dot-com crash. But the downturn has sent a wave of concern through the community of immigrant workers who hold the visa, which companies use to hire skilled noncitizens." 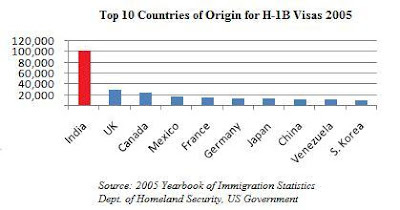 Dot com bust in 2000-2001 followed by post-911 economic slow-down were hard on H1B visa holders. The running joke at the time was that B2B stood for Back-to-Bangalore, not business-to-business. But, somehow, the smart techies survived and then thrived. Short term, things are going to be particularly tough again. But, eventually, there will be a rebound and the highly-educated and smart people like Jay and Prasad are going to do very well. Their hard work and persistence will pay off. My message to Prasad and Jay is: Hang in there , Guys! Don't give up hope! Things will get better. Thank you for this very touching post Riaz. Even if its the same fictitious Jaydev who writes very fanatic stuff on you blog, i pray that he lands a job soon. with draw his offer of employment and rather eager to see him in Microsoft Silicon velley subject to security clearence. From Nov 2008 he is enemployed,as he was expecting vis in a month time. I think Microsoft will honor its commitment to your son. However, if things continue to deteriorate and Microsoft is forced to announce more layoffs of US workers, then all bets are off. High-profile companies like Microsoft will come under a lot of political pressure from US Congress and may have to back out. But they are are a big company and they have to maintain their trust. They will not lie to you. They will tell you if the situation changes in the future. Would the Indian government be willing to grant open ended work visas for Indian companies to hire the hundreds of thousands of laid off US tech workers? read the comments by Romesh Chander and the follow up. LOL. In spite of the discrimination by some Indian hiring managers at Microsoft that is rightly pointed out by a white female commenter on the Wall Street Journal website, Microsoft has been and continues to hire in Pakistan, though the pace has considerably slowed since the financial crisis last year and imposition of new visa restrictions. WASHINGTON: In 2009, India accounted for the third highest increase in the number of illegal immigrants in the US in ten years, according to a new government report, though only two percent of all illegal immigrants were Indians. The number of illegal immigrants in the US fell by seven percent to 10.8 million last year. A majority of them came from Latin America, according to the department of homeland security (DHS) report, though India with 200,000 was the sixth biggest sender of illegal immigrants to the US. In overall numbers, Indians accounted for only two percent of illegal immigrants. Mexico (6.7 million) topped the list with 62 percent, followed by those from El Salvador (530,000), Guatemala (480,000), Honduras (320,000) and the Philippines (270,000). Between 2000 and 2009, the Mexican-born unauthorised immigrants increased by two million or 42 percent. But the greatest percentage increases occurred among unauthorised immigrants from Honduras (95 percent), Guatemala (65 percent), and India (64 percent). "The number of unauthorised residents declined by one million between 2007 and 2009, coincident with the US economic downturn," said the report based on census data and extrapolations from the total foreign population in the country. Beside the US and global financial crisis, other reasons the report adduces for the drop in the undocumented population include tougher border enforcement and a national crackdown on illegal immigrants. The overall annual average increase in the unauthorised population during the 2000-09 period was 250,000 with ten leading countries of origin representing 85 percent of the unauthorised immigrant population in 2009. Of the nearly 11 million undocumented people living in the US in January 2009, 37 percent, or four million, arrived since January 2000, 44 percent since the 1990s and 19 percent since the 1980s, the DHS said. Between January 2008 and January 2009, the number of unauthorised immigrants living in the US decreased seven percent from 11.6 million to 10.8 million after growing from 8.5 million to 11.8 million between 2000 and 2007, DHS said. An estimated 8.5 million of the 10.8 million unauthorised immigrants living in the US in 2009 were from the North America region, including Canada, Mexico, the Caribbean, and Central America. The next leading regions of origin were Asia (980,000) and South America (740,000). California remained the leading state of residence of the illegal immigrants in 2009, with 2.6 million, followed by Texas (1.7 million), Florida (720,000), New York (550,000) and Illinois (540,000). California's share of the national total was 24 percent in 2009 compared to 30 percent in 2000. The greatest percentage increase in the illegal population between 2000 and 2009 occurred in Georgia (115 percent), Nevada (55 percent) and Texas (54 percent). In 2009, 61 percent of unauthorised immigrants were aged 25 to 44 years, and 58 percent were male. Males accounted for 62 percent of the illegal population in the 18 to 34 age group in 2009 while females accounted for 52 percent of the 45 and older age groups. Last week, Representative Zoe Lofgren of California, the senior Democrat on the immigration subcommittee of the House Judiciary Committee, introduced a bill that would increase the wages employers would have to pay H-1B workers, in an effort to ensure they do not undercut Americans. The measure is specifically aimed at Indian outsourcing companies. Last year, Congress added an extra $2,000 to the fee for H-1B visas, in another move aimed at the Indian companies. In general, B-1 visas are granted to business visitors coming to the United States for short stays to attend meetings, conferences or training sessions, or to install specialized equipment. Visitors may not be employed for contract work like H-1B workers, nor can they be paid salaries in this country. There is no annual limit on business visitor visas, whereas H-1B visas are restricted to 85,000 a year. Mr. Palmer said his supervisors asked him to write letters inviting workers to come from India for sales and training meetings, letters he believed were false. “I refused to write the letters,” he said. After word got out of his refusal, Mr. Palmer said, he was chastised by his managers and began to receive threats by e-mail and telephone. In October, Infosys has confirmed, Mr. Palmer filed a whistle-blower report about B-1 visa holders from India assigned to projects he or others managed. His report said the B-1 visa holders were doing the same tasks as workers on H-1B visas, including writing and testing software code. Mr. Palmer said he personally knew of at least 60 Indian workers doing contract work on B-1 visas. The jobs stolen by Indian and other foreign IT firms to hire code coolies in their country have cost the US middle class many many trillions of dollars and decimated their std of living in America. Such evidence stares at us from the performance of several Asian countries in the past few decades. These countries seem to understand that job creation must be the No. 1 objective of state economic policy. The government plays a strategic role in setting the priorities and arraying the forces and organization necessary to achieve this goal. The rapid development of the Asian economies provides numerous illustrations. In a thorough study of the industrial development of East Asia, Robert Wade of the London School of Economics found that these economies turned in precedent-shattering economic performances over the '70s and '80s in large part because of the effective involvement of the government in targeting the growth of manufacturing industries. However, our pursuit of our individual businesses, which often involves transferring manufacturing and a great deal of engineering out of the country, has hindered our ability to bring innovations to scale at home. Without scaling, we don't just lose jobs -- we lose our hold on new technologies. Losing the ability to scale will ultimately damage our capacity to innovate. ...."Knowledge work", supposedly the west's salvation, is now being exported like manual work. A global mass market in unskilled labour is being quickly succeeded by a market in middle-class work, particularly for industries, such as electronics, in which so much hope of employment opportunities and high wages was invested. As supply increases, employers inevitably go to the cheapest source. A chip designer in India costs 10 times less than a US one. The neoliberals forgot to read (or re-read) Marx. "As capital accumulates the situation of the worker, be his payment high or low, must grow worse." We are familiar with the outsourcing of routine white-collar "back office" jobs such as data inputting. But now the middle office is going too. Analysing X-rays, drawing up legal contracts, processing tax returns, researching bank clients, and even designing industrial systems are examples of skilled jobs going offshore. Even teaching is not immune: last year a north London primary school hired mathematicians in India to provide one-to-one tutoring over the internet. Microsoft, Siemens, General Motors and Philips are among big firms that now do at least some of their research in China. The pace will quicken. The export of "knowledge work" requires only the transmission of electronic information, not factories and machinery. Alan Blinder, a former vice-chairman of the US Federal Reserve, has estimated that a quarter of all American service sector jobs could go overseas. Western neoliberal "flat earthers" (after Thomas Friedman's book) believed jobs would migrate overseas in an orderly fashion. Some skilled work might eventually leave but, they argued, it would make space for new industries, requiring yet higher skills and paying better wages. Only highly educated westerners would be capable of the necessary originality and adaptability. Developing countries would obligingly wait for us to innovate in new areas before trying to compete. But why shouldn't developing countries leapfrog the west? Asia now produces more scientists and engineers than the EU and the US put together. By 2012, on current trends, the Chinese will patent more inventions than any other nation. As a new book – The Global Auction (by sociologists Phillip Brown, Hugh Lauder and David Ashton) – argues, the next generation of innovative companies may not be American or British and, even if they are, they may not employ American or British workers. It suggests neoliberals made a second, perhaps more important error. They assumed "knowledge work" would always entail the personal autonomy, creativity and job satisfaction to which the middle classes were accustomed. They did not understand that, as the industrial revolution allowed manual work to be routinised, so in the electronic revolution the same fate would overtake many professional jobs. Many "knowledge skills" will go the way of craft skills. They are being chopped up, codified and digitised. Every high street once had bank managers who used their discretion and local knowledge to decide which customers should receive loans. Now software does the job. Human judgment is reduced to a minimum, which explains why loan applicants are often denied because of some tiny, long-forgotten overdue payment. The fine, which the US Department of Justice said is the largest in a case of its kind, comes as US lawmakers consider legislation that would make it more difficult and costly for Indian IT firms to send workers to the United States on temporary, restricted visas. "Infosys denies and disputes any claims of systemic visa fraud, misuse of visas for competitive advantage or immigration abuse. Those claims are untrue and are assertions that remain unproven," Infosys said in a statement. "There were no criminal charges or court rulings against the company. Furthermore, there are no limitations on the company's eligibility for federal contracts or access to US visa programs as a result of the settlement," it said. Infosys, India's second-largest IT services exporter, employs roughly 15,000 people in the United States. As of March 31, about 10,800 of those were on H-1B visas, which allow an employee to stay and work in the United States up to six years, and 1,600 were on temporary L-1 visas, a company filing said. The US investigation focused on the use of B-1 business visas and I-9 forms, Infosys has said. I-9 forms verify the identity of employees and their authorisation to work in the United States. A person on a B-1 visa in the United States can participate in meetings but is not allowed to work. "It is likely to add more fuel to the ongoing debate around visa reforms," Chirajeet Sengupta, practice director in Mumbai at Everest Group, which advises clients on technology vendors, said on Tuesday after reports that a settlement was imminent. "These reforms, if executed, have the potential to impact Indian service providers' landed resource model that is largely driven by access to H-1B visas in large numbers," he said. In its statement, Infosys said only 0.02% of the days that Infosys staff worked on US projects last year were performed by people on B-1 visas. "The Company's use of B-1 visas was for legitimate business purposes and not in any way intended to circumvent the requirements of the H-1B program," the Bangalore-based company said. Infosys has secured roughly one B-1 visa for every 10 H-1B visas, according to a person with direct knowledge of the matter who declined to be identified. US authorities have been looking into Infosys' use of visas since 2011. Earlier this month, Infosys set aside a reserve of $35m, including legal fees, as it worked towards a resolution of the US investigation. The case is "an important event in the annals of Indian IT industry," Sundararaman Viswanathan, a consultant in Bangalore with Zinnov, which advises US corporations on sending outsourcing work to India, said ahead of the settlement. "This is a common issue amongst all the Indian service providers – just that Infosys had to deal with it," he said. "Though the Indian service providers do not intend to flout the visa regulations, there was definitely a lack of regard for certain norms and procedures. This will be fixed. There will be an increase in onsite hiring," he said. Scopus Consulting Group and Orian Engineers, two companies based in Silicon Valley and owned by an Indian-American Kishore Kumar have been ordered to pay fines of $103,000 to the federal government. Along with this, the company is required to pay $84,000 in back wages to its employees who are carrying H-1B visas. The two companies bring workers from India and other countries on H1B visas to employ them as software engineers for Silicon Valley firms such as eBay, Apple and Cisco Systems. During investigations, US Department of Labor Wage and Hour investigators found that the two companies violated the H1B provisions of the Immigration and Nationality Act by misrepresenting the prevailing wage level on the Labor Condition Applications required by the act, an official release said yesterday.Federal Administrative Law Judge Stephen R Henley ordered the two businesses owned by Kishore Kumar to pay 21 workers $84,000 in back wages and $103,000 in fines to the federal government. “Some of the country’s most cutting-edge, successful organisations benefit from underpaid H-1B workers,” director for the Wage and Hour Division in San Francisco, Susana Blanco said. “H1B workers must be paid local prevailing wages. We will not allow companies to undercut local wages and hurt US workers and businesses who pay their workers fairly,” Blanco said.